The new features absolutely justify the price increase from 2Meters, making it less a 'passive' device than before and thus a significantly more useful one. Loads of new features, on top of the addition of the new RMS meter. Genuinely useful. Still great value. The sequel to PSP's analogue metering plugin duo, 2Meters, TripleMeter improves on its predecessor in several areas, the most obvious of which is the addition of an RMS meter. 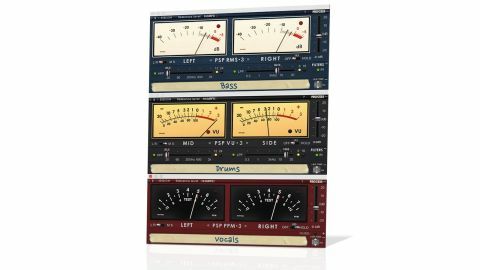 "PSP has not only added a gain control slider, but also high- and low-pass filters"
The new meter joins the established PPM and VU and all three modules have been rolled into a single plugin, with next/previous buttons for instantly stepping between them. As well as that, clearly rattled by our only criticism of 2Meters - that it didn't boast a gain control - PSP has not only added a slider for that very function, but also high- (20Hz-2kHz, 12/24dB/octave) and low-pass (300Hz-30kHz, 6/18dB/octave) filters, editable scribble strips, and a choice of global, project-wide or per-instance calibration. Of course, TripleMeter retains the superb, perfectly responsive metering of the originals, with rear-panel adjustment of ballistics, reference levels, hold and fall times, etc.